One of Canyon Creek's most popular stains, Graphite is a rich, warm grey-brown that fills the space between a true grey stain (like Sea Drift) and brown tones such as Sable or Caraway. Graphite is a “chameleon” color that allows the grain pattern and natural colors of the wood to show through. As with all wood/stain combos, but especially because of the way Graphite brings out such a variety of tones on the different woods, we recommend ordering a sample door in the style and species you’re considering. Below, Canyon Creek paired Graphite with a couple of lighter colors in beech, cherry, hickory and maple so you can see how well it works as an accent to another color. 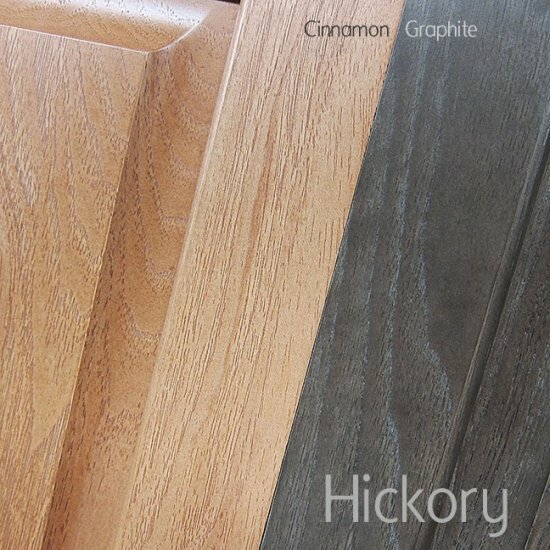 Notice how Graphite is much more grey on hickory and maple, and tends toward the brown tones on beech and cherry. Canyon Creek Wall Beds now come with Murphy Bed hardware!